Buffalo Brand Apple Crate Labels. 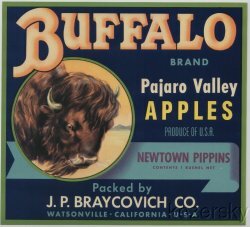 Vintage apple crate label from Newton Pippins, J.P. Braycovich Co., Watsonville, California. Image of a buffalo. Buffalo Brand Apple Crate Labels. Vintage crate label from Newton Pippins, J.P. Braycovich Co., Watsonville, California. This original, mint 1930s label measures 9.5x10.25 inches. Image of a buffalo. Please note that this label will be securely packaged and shipped by USPS Priority Mail so as to prevent any damage in transit to you.